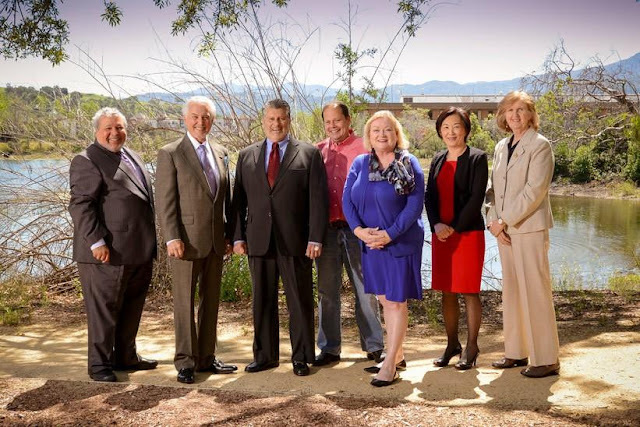 The board will revisit the issue on Tuesday, May 8, at 9:30 a.m. in the board room at the district headquarters, 5750 Almaden Expressway, San Jose, CA 95118. Board directors requesting more time to review the materials included Chair Richard Santos, Director Linda J. LeZotte, Director Nad Hsueh, and Director John L. Varela. In fact, Chair Santos requested a delay on the vote until July when the District would receive confirmation of potential funding for the expansion of Pacheco Dam on Pacheco Creek, a tributary of the Pajaro River. The district in October approved support for the project on the condition that Brown reduce the project to just one tunnel, but the staff now recommends that the board commit to the full project at a cost of $650 million. At one point during the meeting, Santos asked if the Delta Tunnels would bring the district more water. Staff said the project would “sustain” existing water supplies; in other words, it wouldn’t provide any new water. Thirty-seven people spoke during the public comment section of the five-hour-long meeting, the vast majority ratepayers opposed to the project. Delta Tunnels advocates were encouraged by the Board’s decision to delay the vote — and urged them to vote no on the project at the next meeting. The board also requested that staff add a water affordability analysis to next week's discussion, in addition to a comparison of local alternatives that would affect water rates, noted Barbara Barrigan-Parrilla-Parrilla, Executive Director of Restore the Delta. “There are so many better solutions for creating a sustainable water supply in California, and we hope that this delayed vote, the addition of a water affordability analysis, and a comparison of local self-sufficiency projects will allow Santa Clara Valley’s board of directors to realize that the Delta Tunnels is not the project that will bring our state water management into the 21st century,” said Barrigan-Parrilla. “What we witnessed this evening at SCVWD was the Department of Water Resources exercising a bully strategy to strongarm SCVWD into participating in the Delta Tunnels. We hope that with more review the board will be empowered to stand up against MWD and make the right decision for all of California,” she said. “Regardless of the SCVWD’s decision next week, this fight is far from over. We will pack up our picket signs and head home when Governor Brown, or the future Governor of California puts a stop to MWD’s relentless process to see this project through at any cost,” concluded Barrigan-Parrilla. “The move likely violates state propositions requiring local government taxes and water fees to be proportional to the services provided. MWD’s proposal would allow Southern California residents to be taxed to subsidize wealthy corporate agriculture in Central Valley,” she added. If SCVWD decides to commit up to $650 million to the tunnels, the addition of MWD’s $11 billion cost share and the Kern County Water Authority’s contribution of $1 billion is still over $4 billion short of fully funding the $16.8 billion project, Barrigan-Parrilla pointed out. A broad coalition of fishing groups, Tribal leaders, conservation organizations, environmental justice groups, Delta residents, cities, counties and water districts opposes the Delta Tunnels. Opponents say the California WaterFix would hasten the extinction of Sacramento River winter-run and spring-run Chinook salmon, Central Valley steelhead, Delta and longfin smelt, green sturgeon and other fish species, as well as imperil the salmon and steelhead populations on the Trinity and Klamath rivers. Opponents also point out that the project would increase the cost of water for ratepayers in water districts funding the tunnels without providing any new waters. Deirdre Des Jardines of California Water Research also reveals that the proposed WaterFix/Delta Tunnels go through the West Thornton-Walnut Grove and River Island gas fields, just east of the Rio Vista gas field, the largest natural gas field in California.